Hailing from Pennsylvania the Death Metal quartet Aletheian have released their long awaited CD The Dying Vine on Metal Blade Records. Combining Death Metal with elements of Technical and Progressive Metal then adding in a bit of melody to boot Alethian have constructed a record that was well worth the wait. 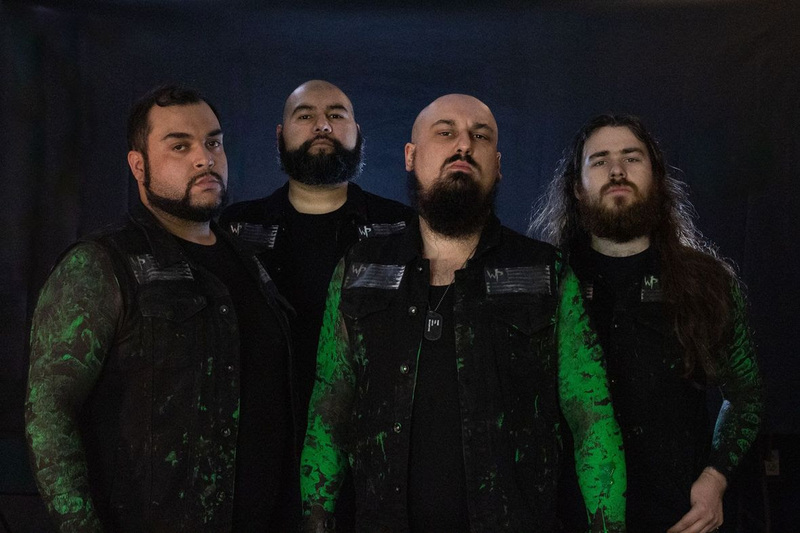 Contrasting a brutal musical assault with a message of hope, Alethian are taking their brand of Death Metal to the masses this summer playing the Cornerstone Music Festival as well as many other shows. Vocalist Joel Thorpe took a moment to answer some questions about the band, their message, and their sound. Many of your songs are so hard and intense that I am sure they translate well into a live setting taking on a whole new life in front of a live audience. 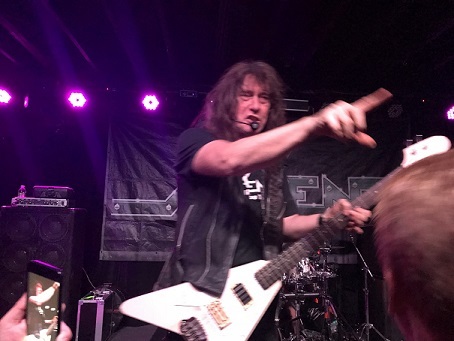 How does it make you feel when the emotion and power that you envisioned in the recording studio, comes to life while playing in front of a crowd? Well, for the most part, we have always written the songs to be great live, and then we've played them live many times before we actually recorded them. This way we can work out the kinks and really get familiar with the material. Then in the studio, the songs flow more naturally and they can embody more of that live intensity because we've already experienced it. Then we like to embellish and fill-out the live versions in the studio with additional instruments, rhythms, etc... But there is nothing more satisfying than a great high-intensity live show with an enthusiastic audience full of fans. The name of the band Aletheian is interesting to say the least and sounds as if there is a story behind it. Where did the name come from and what is the story? After 5 years with the name 'Crutch' (which got us confused with dozens of other bands), we wanted to change the name to something more unique and meaningful, which also embodied the progressive nature of our sound. We were in the middle of writing a concept album that used a lot of Greek symbolism and terminology and we came across the root word "aletheia". After a little research and discussion, we felt that "Aletheian" was the right fit for where we wanted to go with the band. "Aletheian" is a form of the Greek root for "Truth". Our primary message as a band is that there is truth in this broken world, and the truth is that there is hope, beyond all darkness and despair. Basically, we traded in a simple name that got confused with other bands all the time, for a name that no one can spell, pronounce, or remember. But we think it's a good fit for us. Your brand new CD titled Dying Vine is set for release on this month. Now that it is complete how you do feel about it? Are you satisfied with the outcome? Yes, we started recording the album in Nov of 2004, and then had a 4 month delay due to an injury to our guitarist's hand. We finished recording in late spring 2005, and released the album on our own over that summer. Now the album has been thoroughly remixed, mastered by West Side Studios in NY, and has all new artwork and a bonus track; a cover of "How Could I" by Cynic. It feels good to have something that we've worked on for such a long time, finally get the chance to be released on a great label and get a little bit of exposure. Now, we look forward to doing a long overdue new album. Give us some insight into the record Dying Vine and the meaning behind its title? This source is alluded to as the "Root", and our lives are the extensions of this "Root", therefore taking on the imagery of the "vine" or "branches". In connection with the root, the vine flourishes and bears great fruit. Apart from the source, we only wither and ultimately die. The album follows this general theme throughout, starting with Paragon which is the "example" that has been set, demonstrated for us, but then has been destroyed by our own self-indulgent desire to make our own path in life. The other songs deal with various struggles that are results/symptoms of living life separated from the "root". The final song, Call to Arms is the rallying cry for renewal, the statement of Hope that there is still time to reconnect the "dying vine" to the "root" of life. Your lyrics are infused with heavy detail and raw emotion. What is it that normally gives you inspiration when writing lyrics and is there a theme or themes behind the writing of this record? I predominately write based on personal experience/observation. I think that the rawest of emotions are those that are actually your own. I usually write about struggles and the darker parts of life, but try to show the positive and hope-filled possibilities despite the circumstances. A lot of people feel trapped in this broken world, or lost in a sea of despair. But I want to be able to offer an alternative point of view, to encourage people to have hope and to choose to rise above the darkness and make changes. Pain is inevitable in this world, but misery is optional. Amidst despair, hope prevails. Even though the songs on Dying Vine are packed to the gills with huge guitars, intricate rhythms, and complex arrangements, there are still strong songs at the core of it all. When you write do you start building from a simpler frame and then just stack up all of the individual parts and nuances? Yes, that's sort of how we do it. The songs start as a theme or an idea that is designed to communicate a certain feeling, or to take the listener on a sort of "emotional journey". Alex writes almost all of the song structures, and then once we have the framework in place, we start adding more and more to it, until we feel like we've come close to capturing the idea we had in mind. The band keeps things interesting thematically. Can you talk about some of the subjects you tackle on this record? As I mentioned before, a lot of the themes are loosely interrelated, and a few I have already touched on. But I'll briefly mention a few more. Out From the Shadows deals with personal accountability and taking ownership of your own actions rather than trying to pass the blame. As the Fall Breaks is about the regrets that come from not having said what you should have, when you had the chance. It's a song about a friend who took his own life, and another friend who died in a bizarre accident. Both of which I failed to stand by in their time of need, and now will never have a chance to apologize. There is no guarantee that tomorrow will come. There is no guarantee that you will have a second chance. So work out your problems with people now, while you still can. Open Grave is about beautiful young sisters who have a terminally degenerative disease with no hope of a cure within their lifetime. It's about how they have embraced their fate and are living life and radiating beauty regardless of their plight. It is also about the pain and struggle and rage felt by those who can do nothing to help the situation except stand by watching and waiting as these beautiful young girls die. It is good to see a number of bands breaking away from the usual gore/horror, misogynist and anti religious themes. What prompted you to pursue this specific course in lyrical concept? I want to be able to offer an alternative point of view, an expression of the hope that can be found in this life. Hope that there is redemption and restitution. Hope that there is a promise of renewal and an end to all fears; hope that is found in Christ alone. Along those same lines you guys have put a different spin on the whole Death Metal scene. In a genre known for dark and often demonic themes, you have done the exact opposite, adding positive messages and themes. Do you think this will sit well with fans of the genre? Has there been any backlash from the Death Metal community? We're not preachers in disguise and we're not giving sermons or reading from the bible. We're a progressive Death Metal band that writes songs about the passions and struggles of life. We bring the highest caliber music we can create with a positive message of Hope. If people don't want to like us or listen to our music because we have a positive message, that's a shame. It's also incredibly shallow and judgmental, but everyone is free to make their own decision. We have gotten a fair share of snide remarks, disrespectful comments, sneers, etc� but no "backlash" per se. For the most part, people really respect the music, and just ignore the message if they don't like it. The art work by is quite amazing. How does it tie into the albums title? The artwork is courtesy of Dinunzio Design, and it is intended to show the tension between the darkness of the impending death of the withering vine, and the glimmer of hope in rebirth. The artwork is a kind of balance between beauty and turmoil, while also illustrating the isolation of the uprooted status of individualism. We are all fairly active guys; we try to stay in pretty good shape. The first few nights of tour there are usually some muscle pains, but no big deal. Adrenaline usually makes up for all of that anyway.